A pound of wings braised in our Pale Yeah, then deep fried to order tossed in your choice of sauce: house hot, jalapeno marmalade, Mas Macho BBQ or habanero peach. Jumbo lump crab cakes served with remoulade. Chicken eggrolls served with habanero peach sauce. Three soft pretzels served with our Oregon Street IPA beer cheese. Slow roasted pork pulled apart then stewed in Lupulo Rojo American Red Ale and poblanos served with hot, buttered flour tortillas. Brussels sprouts braised in our Mas Macho Pilsner then sautéed to order with pork belly sausage and a savory balsamic sauce. Fried green tomatoes, buffalo mozzarella, baby heirloom tomatoes, basil with an aged balsamic glaze. Shrimp sautéed in garlic and fire roasted tomatoes in our All Saints Hefeweizen then finished with butter. baby heirloom tomatoes, candied walnuts, shaved asiago, mixed greens and spiced croutons with All Saints Hefeweizen white balsamic vinaigrette. Candied walnuts, pickled onions + jalapeños and feta on arugula with All Saints Hefeweizen white balsamic vinaigrette. Grilled chicken, spiced croutons, romaine lettuce, shaved asiago, baby heirloom tomatoes with chipotle Caesar dressing. Grilled salmon, mixed greens, feta cheese, baby heirloom tomatoes, pickled onions + jalapeños with lemon basil vinaigrette. All burgers are made with brisket + beef short rib, on a ciabatta roll. Served with steak fries. Our brisket + short rib patty, topped with provolone cheese, bacon, avocado, jalapeño marmalade, a crispy onion ring + a fried egg. Served with steak fries. Our brisket + short rib patty, topped with cheddar cheese, arugula, tomato, pickled jalapeños + onion. Served with steak fries. Our brisket + short rib patty, duck bacon + Oregon Street IPA beer cheese with an arugula and baby heirloom tomato salad and white balsamic. Served with steak fries. Our brisket + short rib patty, green chili pork, pepper jack cheese, lettuce, tomato, pickled jalapeños + onions topped with a fried egg. Served with steak fries. Turkey, cranberry chutney, peppered bacon, tomato + arugula on jalapeño corn bread. Served with mesquite BBQ house chips. Turkey, basil hummus, baby heirloom tomatoes + feta cheese served with mesquite BBQ house chips. Pale Yeah battered chicken tenders + steak fries. Pale Yeah! Ale battered cod fried golden. Served with remoulade and mesquite BBQ house chips. 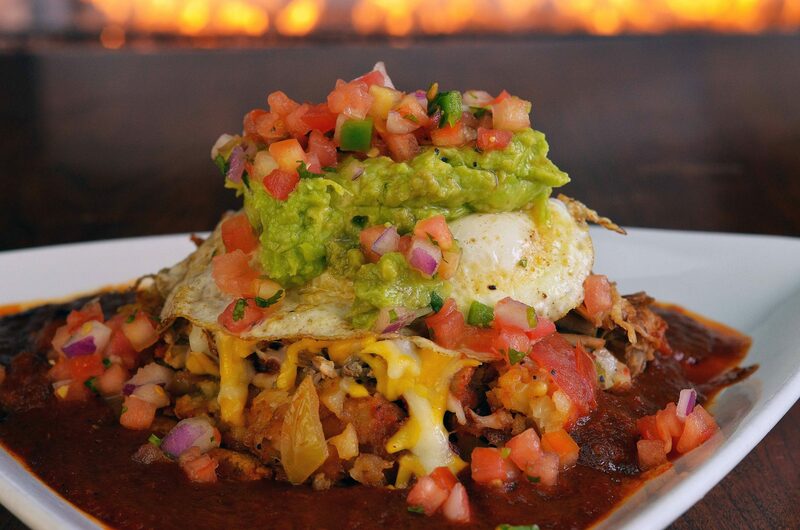 Green chili pork, topped with fire roasted poblano hash, three cheese blend, guacamole, pico de gallo + a fried egg. Shrimp, garlic, asparagus, spinach and fire roasted tomatoes served with Campanelle pasta. Porcini mushrooms and black truffle stuffed ravioli in a creamy alfredo sauce with roasted red peppers. Three bone-in pork shanks beer braised, fried and then grilled. Campanelle pasta smothered in an American + white cheddar cheese sauce covered with provolone, mozzarella + ancho bread crumbs. Slow roasted prime rib, sautéed onions + mushrooms topped with provolone cheese + horseradish served on a hoagie roll. Alfredo sauce, duck bacon, mushrooms, arugula, roasted red bell pepper, provolone + mozzarella. Jalapeño marmalade, pork shank, pork belly sausage, pickled onions, jalapeños, provolone + mozzarella. Basil pesto, baby heirloom tomatoes, fresh mozzarella, pine nuts, provolone + mozzarella. consuming raw or undercooked meats, poultry, seafood, shellfish, or eggs may increase the chance of foodborne illness.